The Estrella, located at 112 Barefoot Park Lane, is open daily for tours. Austin, TX (December 29, 2016):David Weekley Homes, the nation’s largest private home builder, has a new model home open in the Georgetown community of Wolf Ranch. Nestled in the scenic Hill Country, The Estrella is open daily for tours. The Estrella is one of nine floor plans available in Wolf Ranch and is situated on a 60-foot homesite. The one-story home features 2,800 square feet of living space with three bedrooms, three full baths and a three-car garage. Designer touches include a study, an outdoor living area with sliding glass doors and a bay window in the owner’s retreat. The Estrella is one of Weekley’s interactive Design it Yourself floor plans, which allows customers to utilize an in-house kiosk or the builder’s website to create a floor plan that customers design themselves. The program guides home shoppers through four steps to complete a floor plan, providing real-time updates to room counts and pricing. Users can print the plans they’ve created and review with a sales consultant to begin building the home based on their own design. Residents of Wolf Ranch have access to highly-regarded Georgetown ISD schools and a variety of amenities, including community pocket parks, more than 15 acres of open space, miles of trails, and proximity to Wolf Ranch Town Center for shopping, dining and entertainment. Planned amenities include an amenity center with a resort-style pool overlooking the San Gabriel River. 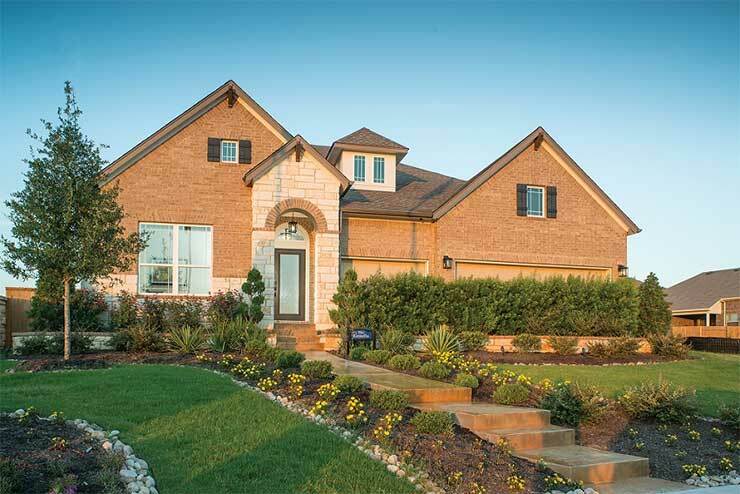 For more information about David Weekley Homes in Wolf Ranch, call 512-821-8874.